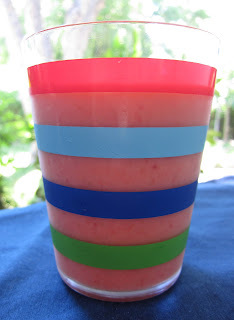 Summer of Smoothies: Watermelon Wowza! The strawberry is one of my favorite fruits. So much flavor in such a small package! This second Summer of Smoothies concoction is quite refreshing and not overly sweet. It made for a great cool down after a sweltering run the other morning. This recipe made enough to fill two pint classes plus a little extra.